The UK’s car factories have enjoyed their busiest month since the turn of the millennium as an improving European sales market and continued strong exports saw car production reach a 17-year high. Figures from the Society of Motor Manufacturers and Traders (SMMT) show that 170,691 cars rolled off production lines in March, a seven per cent rise and the highest since 2000 when 183,787 vehicles were built. And in the first quarter of 2017, 471,695 cars were produced, also the best performance since 2000. 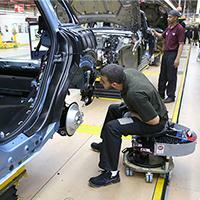 Exports continued to drive British car manufacturing as demand rose 10.6 per cent in the month, the SMMT figures show. Of the thousands of cars built in the UK last month, overseas buyers ordered more than 76 per cent of them. However, there was a decline domestically, with demand down -4.3 per cent in the quarter. Mike Hawes, SMMT chief executive, welcomed the rise in production but warned about regulatory threats to diesel cars and Brexit. “UK car manufacturing is accelerating thanks to billions of pounds of investment committed over the past few years,” he said. “A large proportion are the latest low emission diesels and it’s essential for future growth and employment that we encourage these newer, cleaner diesels onto UK roads and avoid penalising consumers who choose diesel for its fuel efficiency and lower CO2 emissions. Dealerships will be pleased to hear the positive news for the UK’s car industry. Heading through 2017, you may well be looking to add to your business to capitalise on growing demand. motor trade insurance updated so your entire business is covered.